The party went 3 for 3 in open seats, picking up districts formerly held by Sens. 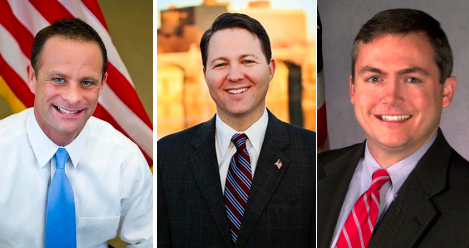 Jane Earll (R-Erie), Jeff Piccola (R-Dauphin) and John Pippy (R-Allegheny). Sean Wiley defeated Republican Janet Anderson by 20 points in the Erie-based 49th district, 60 percent to 40 – a difference of more than 20,000 votes. Wiley, an executive at the St. Vincent Foundation and former employee in government, consistently lead the race. State Rep. Matt Smith beat Republican Raja in the Allegheny/Washington County 37th district by 6,800 votes, 53 percent to 47 percent. This was a very negative race, with Raja blasting Smith for taking Harrisburg perks and raising taxes; Smith slammed Raja for outsourcing jobs. And in the narrowest Dem pickup of the night in the most-watched race in Pa., Rob Teplitz beat Republican John McNally. Teplitz, who is Chief Counsel to Auditor General Jack Wagner, beat attorney and former Dauphin GOP Chair McNally by 3,800 votes, 51.6 percent to 48.4. Teplitz hung around McNally’s neck comments the Republican made during the primary where he said he’d have supported Gov. Tom Corbett’s budgets – including their education funding. The big night will immediately shift the balance of power in the Senate, where Republicans had held a 30 to 20 majority. Now, they’ll have 27 seats to 23 for the Democrats. The math is important. The Senate Republicans have consistently tempered more conservative legislative efforts from House Republicans, in part because the Senate caucus contains half a dozen moderates – mostly from southeast Pa. Now, they’ll have to moderate even more to maintain the party line. Meanwhile, three targeted incumbents held onto their seats. Sen. John Wozniak (D-Cambria) had the closest call of the night. Funeral Director Tim Hauser came within 2,100 votes of unseating the longtime elected official. Wozniak won 51.2 percent to 48.8. Republican Sens. Dave Argall (R-Schuylkill) and Elder Vogel (R-Beaver) had more comfortable wins. Argall defeated former state Rep Tim Seip by 12,000 votes, 56 percent to 44. Vogel overcame businesswoman Kim Villella, once a highly touted Dem challenger, by 14,000 votes, 57 percent to 43. *Correction: an original version of this article cited an operative who called Tuesday the biggest swing in the Pa. Senate since the Civil War. As several PoliticsPA readers noted in the comments section, that is not the case. No problem they will simply add to the Dems that currently control the PA Senate now who call themselves conservatives and claim they are Republicans, he he. Historic losses in state houses/state senate, losing 3 row offices, and another US Senate embarrassment….another Gleason/Corbett political “leadership” embarrassment! Wiley, is really arrogant and not so smart. It’ll be a quick 4 years!! voter turnout in the S.D. 37 race? “Jon Vernon”, where are you??? What good men we have elected! It seems America is voting for QUALITY leaders – not the snake oil salesmen and self-serving egotists who occupy those seats now. Congratulations to our new PA Senators! This is a big loss for GOP. The GOP is no longer fpdealing with the lay down mentality of Mellow/Fumo. The GOP campaigns wasted money and were very deficient. Scarnati and pileggi better find a way to work together to deal with this. At least three GOP gains in 1994, so the Civil War parallel is just absurd.